It is important for parents to have the opportunity to exercise on a regular basis, but this can become complicated by having a toddler in your home. After all, they are no longer young enough to simply put them in their crib for a nap when it is time for your daily workout, so you need to find alternative methods to keep them entertained and safe long enough for you to hit your fitness goals. Fortunately, there are many ways that you can keep a toddler safely distracted, and this should make it relatively easy for you to get in shape without needing to stress about whether or not your child is properly entertained. 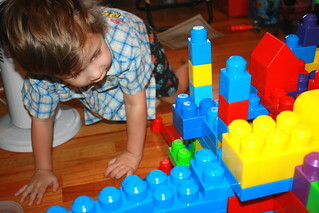 Every toddler enjoys playing, but some toys are more likely to capture their attention for extended periods of time. For example, giving your toddler sports toys that allows them to alternate between many different options such as baseball and basketball will definitely keep them entertained for longer than simply giving them a ball. It is also a good idea to consider an educational toddlers toy that will encourage your child to interact with visual and auditory cues. This can help them improve their hand-eye coordination, and it is likely to command their attention for a long time. Yoga is becoming an increasingly common form of exercise for mothers and their toddlers, and some classes encourage parents to begin bringing their children during infancy. Although this will not provide you with a completely free space to do your own thing, it will give you the opportunity to get in shape while teaching your toddler about the importance of exercising. Additionally, this is a good option for parents who do not want to work out at home. Keep in mind that there are several other ways that you can involve your children, including taking them for a bike ride or using a jogging stroller. If you have any other mothers in your circle of friends, the odds are high that both of you are looking for a better way to keep your children entertained while you focus on getting physically fit. This provides you with the opportunity to either alternate schedule so that you each have a babysitter when needed or workout together while both of your children enjoy a play date. Although no parent wants to rely on television as a babysitter, it can help you gain a few minutes to yourself so that you can work out, clean the house or make a business call. Your best bet is to turn on their favorite movie or show, give them a couple of toys that they love and put a snack in front of them. With all of these distractions, the odds are high that they will not even notice when you move to another portion of the room to exercise, especially if you give them time to get absorbed into the show first. As you can see, there are many techniques that you can utilize to make it much easier to fit in a good workout while keeping your toddler happily entertained. It is also a good idea to take advantage of their nap time because you will not need to worry about constantly monitoring their activities. Regardless of which methods you use, it is vital to make sure that you do exercise regularly. After all, every parent needs to take steps to improve their stamina so that they can more easily keep up with their rapidly growing children. Lisa Coleman shares some tips on how a parent can fit in their workout while entertaining their little one. She recently viewed online a toddlers toy internet page full of fun and interactive ideas that would entertain young tots.